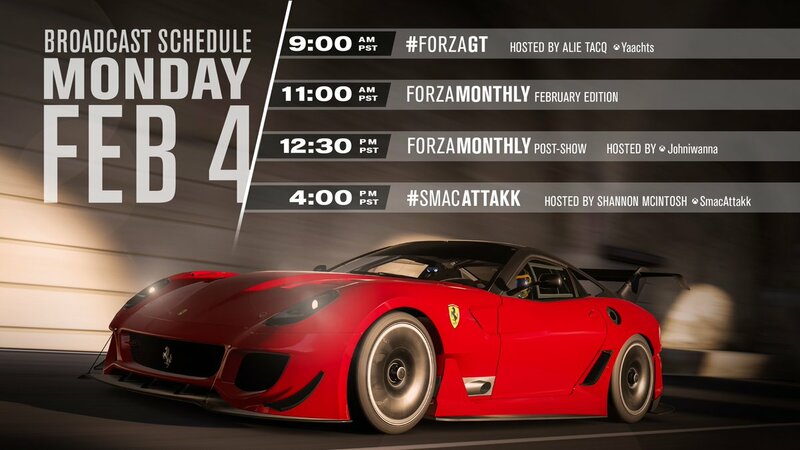 We’re getting geared up for the next episode of Forza Monthly, airing on Monday, February 4 at 11 a.m. Pacific. On the show we’ll be joined by a special guest from Playground Games, who will be showcasing some of the new cool stuff coming in Forza Horizon 4’s next major update. We’ll be diving deep into the February update for Forza Motorsport 7, which includes force feedback updates, multiplayer loading improvements, and some new stuff that we can’t wait for you all to see. We’ll also be showing of the winner’s of our Barrett-Jackson Car Pack photo contest and more. Join us for the show live at 11 a.m. Pacific on Mixer, Twitch, and YouTube! A gorgeous Ferrari, new paint space options, improved load times, and more. The February Update for Forza Motorsport 7 is coming on February 5 and bringing with it some great improvements to the game. Let’s dive in to the biggest changes coming to the game, starting with this month’s Spotlight Car, which is free to all Forza 7 players. Free for everyone and featured in the February Spotlight Rivals event. "First and foremost, the paint space itself now features four user-selectable lighting scenarios – Ambient Light, Ambient Dark, Sunny, and Sunset. This gives the players the ability to view their liveries in a variety of lighting environments, perfect for highlighting those problem areas in a design. In addition, we’ve brought the functionality of Forzavista into the paint space; now players can open doors and hoods, get inside the car, and quickly spin around their car to see how a design is flowing." "We’ve also added Photo Mode to the Paint Space; which can be accessed within the Forzavista option in the Paint Space. This update also adds a Free Camera system in the main garage (accessible via Forzavista), which allows unobstructed movement around the garage home space while in Photo Mode." "This month, we’ve introduced a Force Feedback (FFB) update for wheel users. This update addresses issues that were causing latency between the physics frame and the FFB frame, which manifested as oscillation. With this update, wheel users will feel less oscillation and hitching in wheel FFB." "In addition to these features and changes, we have made some back-end improvements that will improve load times into multiplayer races. These improvements will save players anywhere from 10-30 seconds during a load into a 24-car race. 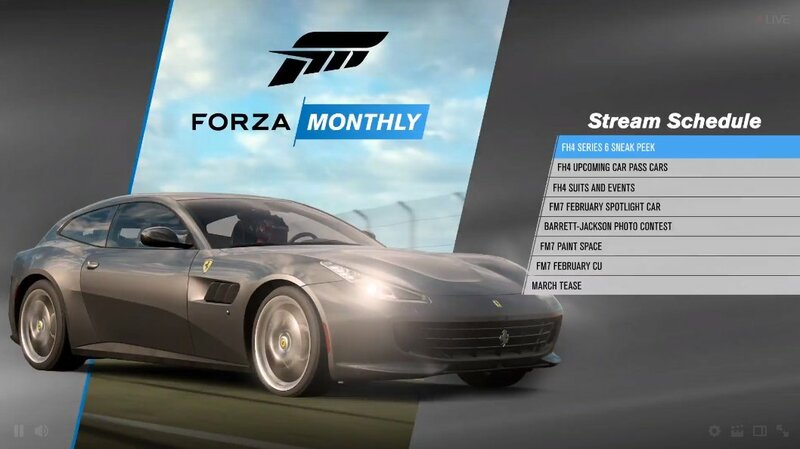 For the full list of improvements and fixes coming with the February update, check out our full Release Notes on the Forza Support site https://support.forzamot...Forza-Motorsport-7"
Well that's yet another car from FH4 that's not in fm7 that appears to be on a track from FM7....possible free car pack from horizon into motorsport? Wow! Is that the Ferrari 599XX Evolution? Pretty sweet car and that will be right at home in this game. February Update arrives February 5. - Paint space lighting update provides options for Ambient (Light), Ambient (Dark), Sunny, Sunset. The sky is randomized whenever the option is reset. - Mazda MX-5 RF coming in March? Did they say anything about tweeking the AI? Any new cars other than the Ferrari station wagon & the 599? A few cool things I guess but overall another disappointment this month. When will they acknowledge and fix freeplay issues, car sounds, lighting on tracks, add better content... looking ahead it looks like they plan to add even more drift **** . How about 2015-newer IMSA prototypes, classic racers or f1 cars, more newer GT cars, new style IndyCars and the biggest thing of all A NEW TRACK! I appreciate the other things they are tackling but they seem to keep missing the major things that have continuously been brought up month after month. - The spectate ticker not working for anything but single-bucket racing. +- Race Regulation System: I don't care. Even if it works as inteded, I will not mutate to a PvP-player. Was a bit better than january, but I have the feeling, the guys focusing on the wrong parts of the game for me. Is it too boring to fix some bugs on cars and tracks? And I still wait to complete the career, because I hoped for some drivatar improvements soon. Well, DiRT Rally 2.0 is out at the end of february, so I will leave Forza for a while. I just really, really hope they announce a big addon on E3 for FM7 with 1 or 2 new tracks and a career-expansion. Around the 31:50 mark of the live-stream, Esaki shows off the new free roam camera in the garage. He goes over to the dry-erase board on the wall & says “hopefully there aren’t any unannounced tracks on the board...knock on wood.” This leads me to believe they will have a new track at some point. I wouldn’t think he would say something like that unless a new track was in the works. Great to see the GTC4Lusso coming. I am confused on when they said that everyone is going to get a free 599XX are they talking about the normal 599XX or the evo becuase they didn't really say just a free 599XX. Calm down guys, we are not getting the 599XX evo. Horizon is. We are just getting the Lusso. Another disappointment from Turn 10 this month. We get both. They announced it in the stream. Although the 599XX seemed like an afterthought. 599XX Evo ... Now that's the sort of content Motorsport needs. Thanks Turn 10, loving the "Elite Factory Racer" line up. Was there any news on race regulations? Great update for wheel users. They get unique setups per car, that's huge and something the likes of Project CARS already had long ago. Ferraris are not my favorite but the 599XX Evo is more interesting than the standard one and a better match for the other track day specials. Stop spreading misinformation. Horizon gets no Ferrari this time. They will get the new TVR Griffith though. the "Beta" hopper is great idea, hopefully it cycled production. Did anybody else notice how the Field of View follows direction of wheels whilst they were drifting the Mx5. That feature could be useful in circuit racing too, e.g looking through apex to exit. Did anyone get what that short drifting footage on the Mazda was all about? Great news on Febraury and March updates. Great job T10 on continue supporting this game. I hope they will keep introducing new features, improvements and fixing things. more cars and more cars.... We have enough cars. It would be time to make new tracks. Or a DLC with tracks. To improve the ffb issues is good. We will see how it works, but the steering ratio is always wrong for wheel users. The wheelmovement are not naturally. In Forza I have to turn the wheel just a little compared to other sims like ac, pcars 2, r3e, and that feels not naturally. Excellent update. Can't wait for the new Force Feedback update for us wheel users. I'm not a massive Ferrari fan but can't complain with two free cars. I'll look forward to testing those out, especially the 599. Loading times getting cut is always a positive. They've really improved the UI & loading since the release of the game. There's still improvements to be made but it's far superior to its launch state. The painting & forzavista improvements are excellent. They'll help photography & painting a hell of a lot. I am praying we get the updates Forza Horizon 4 got in the paint editor aspect though, like painting panels & individual parts of the wheels. I know a lot of people are seeking more tracks to be added, but I think it's a bad idea. What we really need is the content to be refined not added to. We already have hundreds of ribbons & a lot of tracks. What I think we really need is rain & night (if the tracks can be raced at night irl) conditions for almost every track at this point. I hope they add that instead of adding more tracks because it will spice up & improve what we have already got. Honestly I think every track needs a full dynamic weather system like in Forza Horizon 4, but I'd settle for more weather variants for each track. The 599xx Evo will more than likely be in the hypercars division as its a track based version of high performance Ferrari. The elite factory racers are usually the 90s era GT1 style cars. Race regulations should drop next month. I do like the idea of adding weather and night time to other tracks in game as a bare minimum if they really dont plan to add other tracks thru dlc. Along with that they should give us the ability to change the time of day like morning, mid day, afternoon, evening or night. So I'll take either or, a new track(s) or different time of day/ weather for many or all tracks in game. Every time a night or rain track shows up, half the lobby leaves. People really don't want to do that stuff. Just lobby drainers. I don't mind myself but that is just what happens. I don't think it is worth adding that to more tracks. If tracks are behind a DLC paywall and not in rotations it is pointless to add them. Fine if you like time attack but if they implement it like the did in Forza 6, don't bother. Night tracks would be fine...……..if the headlights would work.......which they dont most of the time!! !